Hyderabad will take on Medak while Ranga Reddy lock horns with Adilabad at the Rajiv Gandhi International Cricket Stadium. 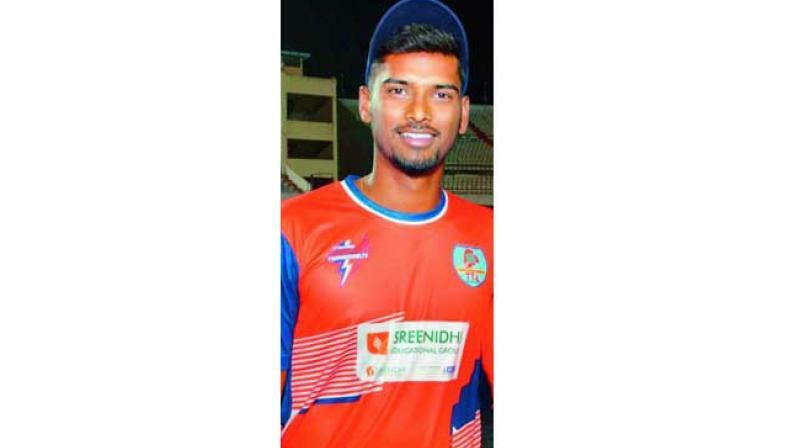 Hyderabad: The Hyderabad Thunderbolts, Medak Mavericks, Ranga Reddy Risers and Adilabad Tigers will slug it out in the semifinals of the G. Venkataswamy Memorial Telangana T20 League here on Saturday. After 45 round robin matches over 20 days in the second league phase, the Thunderbolts topped the table with 16 points from eight victories in nine matches. Ranga Reddy Risers were second with 14 points. Adilabad and Medak, with 12 points each, took the last two remaining spots. Two former Ranji Trophy cricketers — Vankina Chamun-deswarnath and Vanka Prathap — figured among the team owners. While Chamundi’s Ranga Reddy Risers qualified as the second placed team, Prathap’s Karimnagar Warriors finished second last in the 10-team league. Table toppers Thunderbolts are boosted by batsmen Danny Derek Prince and Chandan Sahani who have been in fine nick. Anurag Vital and KSK Chaitanya too have done well. In bowling, Pushkar and Jayaram Reddy have played key roles. Medak relies on Mickil Jaiswal, who is the fourth highest run-getter in the tournament. 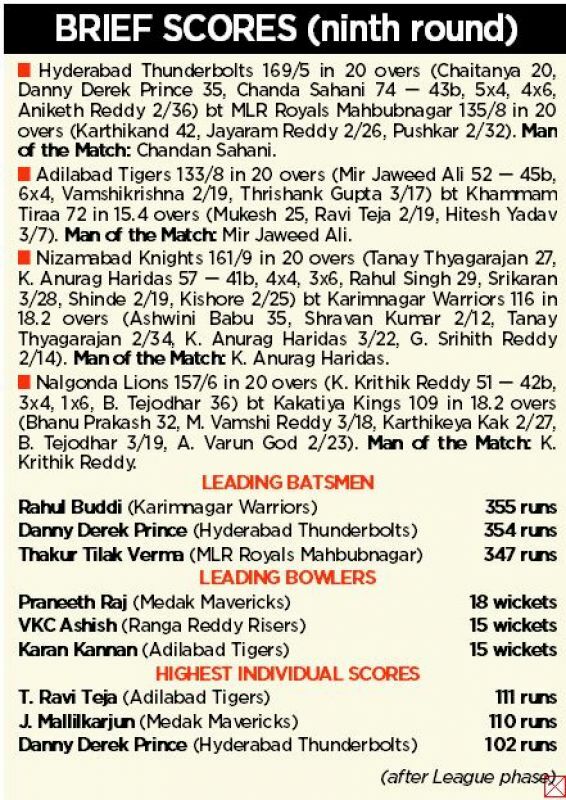 Bowler Praneeth Raj is the leading wicket-taker. The Risers will regain the services of captain P. Akshath Reddy and Mehdi Hasan (after Hyderabad lost in the Vijay Hazare quarterfinals) besides boasting of Prateek Pawar, Vinay Goud, VKC Ashish and Kaneshkk Naidu. Adilabad have captain Neeraj Bist, Benjamin Thomas and Sagar Chourasia to look to in the batting department while Karan Kannan is the joint second wicket-taker currently. In the League’s last round matches, Chandan Sahani scored a fluent 73 in just 43 balls to guide Hyderabad Thunderbolts to a convincing 34-run victory over MLR Royals Mahbubnagar. Chandan hit five fours and four sixes in his essay while Danny Derek Prince scored 35 to guide the Thunderbolts to 169 for 5. Later, the side from the capital restricted Mahbubnagar to 135/7 with Jayaram Reddy and Pushkar taking two wickets each.